Soft PVC material is easily cleans with mild soap and water. Curved frame screens features an advanced aluminum structure with the goal of creating an image made to fit the natural curve of the human eye. Curved frame projector screens allows a true immersive experience for the viewer as the curved feature reaches the peripheral vision, creating the illusion of depth while drawing the viewer further into the picture. This curved frame screen mounts on the wall much like a large picture frame. The sturdy aluminum frame is WRAPPED, not flocked, with a light absorbing black velvet fabric to absorb over-projected light so you don't have to be a professional when aligning your projector. 2. Curved frame allows more light from the projector to be reflected back to the audience so the viewers will enjoy a more vibrant, crisp image than flat screens provide. 3. 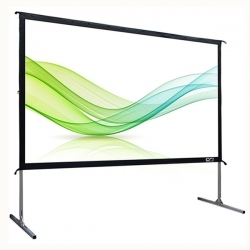 Front projection material with 180˚ viewing angle. Perfect for high-contrast ratio projectors, this quality tension PVC material boasts broad light dispersion through diffusion uniformity, black and white contrast and true color rendition. 4. Features a submursive curved design surrounded in a black velvet 3.5" aluminum frame. Adjustable fix plates provide equal tension over the entire projection surface with an updated rubber edge design that results in an easier installation. 5. Aluminum frame covered with a thick black velvet finish. Made to not only enhance the overall appearance but also helps in absorbing projector light overshoot and enhances perceived picture contrast, resulting in a sleek and beautiful viewing experience. 6. Mildew resistant, easy to clean with soap & water. 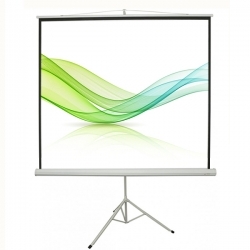 Compatible w/ Standard Throw Projectors - Not compatible w/ Ultra/Short Throw Projectors. A: Our factory has many production lines.